It's a mere handful of bars into the opening track of John David Webster's debut album, Made to Shine, and the raspy-voiced piano player gets right to the point, introducing listeners to both his central message and the wide-open palette of influences that encompass his supremely melodic songwriting. Backed by his rollicking, rhythmic, gospel-tinged piano and a true-blues, juke-joint guitar riff, Webster joyously spells out who we are and who God is on the title track: we were lost and God found us, we were dead and God gave us life, we weren't worthy of love and God loved us anyway ... and all we have to do is reflect the light God has shined on us. Webster's no stranger to this theme-after all, Made to Shine reflects the ebb and flow of the Indianapolis native's own spiritual journey. "I fought with my calling for a long time; sometimes I still do," Webster shares. "I wanted to fit in and be like everyone else. I didn't want the responsibility of doing music for God. When I was younger I tried drugs and other things to take my mind off this tug of war, but it wouldn't work. It wouldn't fit. It was one of these things that God wanted to happen so I would finally have the epiphany that He is all I need-and it was like all the lights came on." Did they ever. The resulting music on Made to Shine-a joyous symphony of pitch-perfect melodic explorations (pop, modern rock, gentle balladry, blues, Americana) consistently anchored by Webster's honest singing and trusty piano-is more akin to fourth of July fireworks exploding across the night sky. "I've always wanted to make a record that felt like a live experience. My goal was a fine balance between nailing the notes and getting the songs across," Webster says of the inspired work he and veteran producer Scott Parker did, painstakingly choosing from among 50 songs prepared for the studio before finally squeezing every ounce of honesty from the 11 tunes that made the final cut. "We ended up keeping most of my scratch vocals-some of my favorite singers' takes aren't perfect, but they're great because of what they leave in." While the lion's share of Made to Shine's songs rock with intensity, it's one of Webster's rare, gentle ballads-"Now"-that packs a surprising emotional wallop as it vividly describes the grace that Webster so badly needed to experience his life-changing encounter with Christ. "It talks about that feeling of complete surrender of letting go and letting God take control," Webster explains. "Throughout my life there have been times I struggled and fought with myself over what I know I should do. God's just always there to pour out more grace. Jesus said that unless you become like a child, you won't enter the kingdom. My first response to getting more responsibility in my career was to take more control-but this song's about giving God everything, and that place of peace afterward. I wonder why don't I let go? Why do I fight so hard? I find all I need is God." "I didn't even realize how rare those opportunities were at the time," he notes unaffectedly. "Growing up I've always known there was a calling on my life to sing for God. At one point in time it was all about music. When I got saved, it clicked in that God is the maker of music. As I started to make public appearances, I realized that the more I focused on Jesus, the more my career went in the right direction." After years of performing and writing songs (beginning when he fronted a rock band in the 8th grade and morphing into an infatuation with jazz during his high school years), Webster got involved in worship at his church-and he also started performing free concerts to share his music and redemption story and recorded his first independent project. 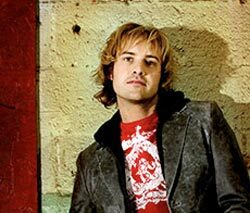 During this time, Webster married his pastor's daughter, Kirsten, and began opening shows for Christian acts, including Delirious, Third Day, Rich Mullins, and The Kry. He then toured with The Kry, playing keys and guitar before releasing another indie CD-which he recorded in Los Angeles with world-class musicians such as Vinnie Caliutta (Sting), Michael Landau (Seal, James Taylor), and Neil Stubenhaus (Elton John). He then hit the road as a solo artist for two years, becoming a father along the way to sons Zion and Jaden. While gigging in Colorado, Webster met music executive Mike Blanton's daughter, Booth, who later gave her father Webster's second indie project, Toward the Western Sky. Blanton expressed interest in working with Webster, and that led to a three-year period of woodshedding the tunes that would become Made to Shine and his eventual signing with Blanton's imprint, BHT Records. As Webster readies his new music for the road, he hopes Made to Shine will strengthen the bedrock connection he already shares with audiences. "I don't want anyone to feel excluded by my music," Webster emphasizes. "I wanted to make a record and write songs that could reach people with on a real level. We're people first, and great music is great music. I wanted to start with that." "I've felt like I've been set aside by God to do something my whole life," he says. "I've tried in the past to make my music work without God, and it just doesn't. My music only works when the light is shining on it." ... you and me were made to shine.